Here’s what’s up in the world of TV for Monday, September 19. All times are Eastern. We guess all of this actually happens in the pilot and then the rest of the show is Erinn Hayes slowly transforming into Dr. Lola Spratt while still also playing this “Donna” character. Come on, you know you’d watch the hell out of that. Kevin Can Wait was ordered straight to series, so maybe Kevin James pitched it like that to CBS. We just don’t know. Lucifer (Fox, 9 p.m.): Yes! 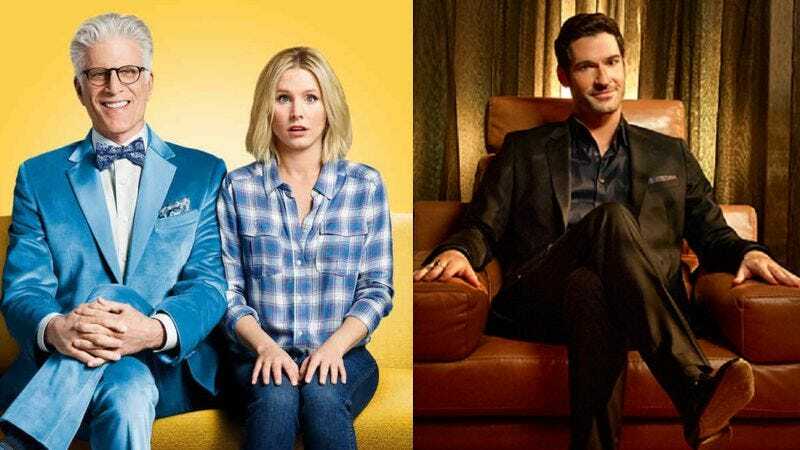 “Everything’s Coming Up Lucifer!” It’s also all coming up LaToya Ferguson, as regular coverage for the series continues for the Devil’s favorite second season. So what’s the haps, Luci? “Lucifer is distracted by his mother’s escape from hell, as he and Chloe investigate the murder of a stand-in actress. Meanwhile, Chloe’s faith in Lucifer is tested by the new medical examiner, Ella. Also, Amenadiel hopes to rein in Lucifer’s wild side, as they both deal with the absence of Maze.” Let’s quash that Maze absence as quickly as possible, please. The Good Place (NBC, 10/10:30 p.m.): “Thanks to some kind of error, Eleanor Shellstrop (Kristen Bell), an ordinary woman, enters the afterlife and is sent to the Good Place—which is definitely not where she belongs. While hiding in plain sight from Michael (Ted Danson), the wise architect of the Good Place who is unaware that he’s made a mistake, she’s determined to shed her old way of living and discover the awesome person within.” That’s right—Kristen Bell is back on TV, and honey child, this ain’t no house of lies (or pies). Also, Ted Danson joins her, so hopefully we won’t be bored to death. (Do you see what we are doing here? Because it’s not all that complicated or clever.) Erik Adams is happy to hang out at The Good Place, according to his pre-season review. The Big Bang Theory (CBS, 8 p.m.): Time to begin 10 seasons of The Big Bang Theory, folks. Bazinga and all that jazz. The Flash! (Your friendly neighborhood What’s On Tonight contributor would like the record to reflect she watched the first seven seasons of the series, so she’s pretty much an expert on all things TBBT. That’s what we call it in the biz.) There is a plot to this episode, as is the norm with television, but honestly, the selling point for this episode is the guest cast. So here we go: Christine Baranski, Laurie Metcalf, Judd Hirsch, Keith Carradine, Katey Sagal, Jack McBrayer, and Dean Norris. You’ve got to admit: That’s kind of impressive. 10 seasons! Fashion Police (E!, 8 p.m.): The Emmys were last night, and you know what? There was definitely some fashion there that deserved a little policing. Good thing Fashion Police exists, right? Gotham (Fox, 8 p.m.): Sorry, Batman V Superman: Dawn Of Justice Ultimate Edition—the real Batman is here. Only, sure, he’s not Batman. Yet. But… Come on, we’re doing a thing here! Gotham is back for its third season, and hey, its cast is still really good! Also, it’s a “Mad City,” that Gotham, which begs the eternal question: Why does anyone ever live in Gotham City? Ever? Oh, wait. This episode is titled “Mad City Better To Reign In Hell…” so that could actually answer that question. The Voice (NBC, 8 p.m.): The Voice returns for its 11th season tonight, and since we don’t have any Miley Cyrus or Alicia Keys jokes up our sleeve (your friendly neighborhood What’s On Tonight contributor was going to try to come up with some, but then she realized that would just be wasting time she could spend on thinking about Lucifer), she’ll just keep it simple. Another season of The Voice, another opportunity for NBC to transform itself into nothing but your one-stop shop for the only shows you need: The Voice and The Blacklist. Pay no attention to whether or not any singers proclaimed “The Voice” in the series’ now 11-season run have actually become as famous (or even just as critically lauded, at the very least, for their… um… voice) as any of the coaches or celebrity mentors on The Voice. Nobody ever said being “The Voice” would lead to that. Match Game (ABC, 10 p.m.): See you later, Match Game. That’s right, the rebooted game show ends its first season tonight. Alec Baldwin has been hosting and charmingly moderating a panel of celebrities all summer, and now it’s time for him to usher in the fall with the show’s conclusion. But don’t worry, John Teti, the show will be back. Oh yes, it will be back. StarTalk (National Geographic Channel, 11 p.m.): The third season premiere of NatGeo’s StarTalk—the Emmy-nominated, Neil DeGrasse Tyson-hosted series—airs tonight, with Whoopi Goldberg as the first guest of the season. Neil DeGrasse Tyson and Whoopi Goldberg together? Set the DVRs now, nerds. Cupid (Amazon Video/Google Play/iTunes/Vudu/YouTube): In all this talk of the Good Place and Lucifer and Kevin waiting, you know who hasn’t been given a fair shake? Cupid. (He fits in here somehow, just go with it.) And because we still kind of feel bad for Bobby Cannavale right now—and we alternate on whether we feel bad for Sarah Paulson or not—we’ve decided to go with Cupid take two as tonight’s streaming pick. Sorry, Paula Marshall. A little less sorry, Jeremy Piven.